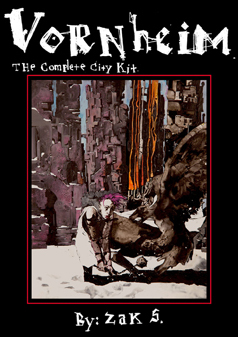 Over on the Views From The Edge forum (here), I put forward the idea of hive-creating a cyberpunk city kit in the vain of Zak S's seminal Vornheim, which was made for OSR D&Dalikes. 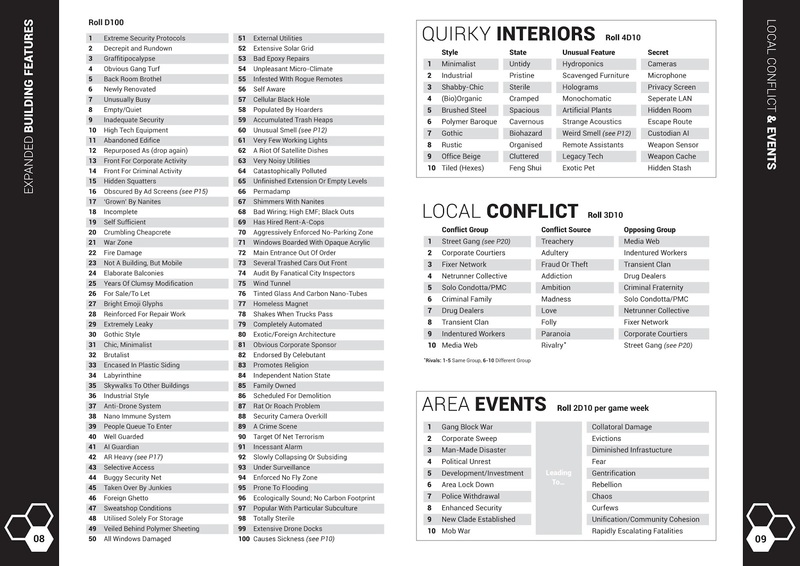 In the excellent Vornheim book, Zak provides a variety of table-based resources designed to quickly add both detail and flavour to fantasy cities on the fly. While he wrote it for himself, and to give him the most utility mid-game, it has proven wildly popular and has become a benchmark of sorts for similar OSR projects. Now, being largely based in complex urban sprawls, most cyberpunk games tend to provide city source material as standard, but are largely based on the pre-Vornheim model of a mishmash of detailed locations, leaving large voids and lacking a lot of flavour. Like with Vornheim, what we felt was needed was something more fluid, a kit rather than a sourcebook, that could be used as the game is in progress, following Zak's philosophy of 'maximum table utility'. I wanted something I could use during the game, was simple to access, sparked ideas with a sentence and basically just added to the game environment and to play. Also, system agnostic would be cool, as not everyone plays CP2020. 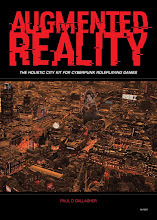 Companero said it best when he defined the project as "taking things you know and adding layers of science fictional strangeness to make it new and exciting" and "to add cyberpunk to the world as it is." With that firmly in mind, some pixels were wrangled and tables started to form, some of which I will be previewing on Neural Archive as the document takes shape. Please bear in mind that these tables and pages are still very much works in progress. Future tables will include Alternative Businesses, Urban Sickness, Legacy Infrastructure, the Sense & The City tables (smells, sounds, sights), Infotainment, What's On The Road/In The Sky, Augmented Reality, the Cabbies table, the Instacitizen drop grid, plus street gangs, corporate aristocrats, fixers, guns for hire, media, tech, junk, freak weather and much more. 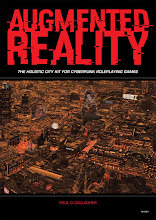 Let me know if there's anything else you'd like to see included in a cyberpunk city kit. Tasty. Can't wait to see more. Thanks Cole. There's quite a bit more waiting in the wings. I've always thought cyberspace was clunky and not super imaginative. Some random "Cyberspace" encounters would be cool. For netrunning, I use the excellent Run.Net rules by Interrupt and co. found here: http://vfte.cyberpunk.co.uk/index.php?showtopic=8662&pid=138610&st=0&#entry138610 The Net and Cyberspace will definitely be tackled at some point in the near future. Random techno-horrors would be cool. Scientific experiments that walk the street looking for victims. Or just a random black ops project. Renegade bio-nasties could be a thing. ;) And your black ops comment has given me a wicked idea… Cheers! There should definitely be table to build out Corporations so they have their own distinct niches, flavors, and styles. They are on top of the food chain and eventually they will take notice if something/someone affects their bottom line. In addition there could be some tables to make different districts of the city unique, similar to the Fever-Dreaming Marlinko supplement (only less gonzo and cyberpunk themed obviously). Maybe some tables for generating opposition? So one group of private security has [flak jacket][pistols][military discipline] while another has [armored trench coats][katanas][disorganized]. And a mission generator for when the Johnson contacts the players to do a little work. So the employer want the players to [action] the [macguffin/location/person], etc. Nice ideas there Odog. 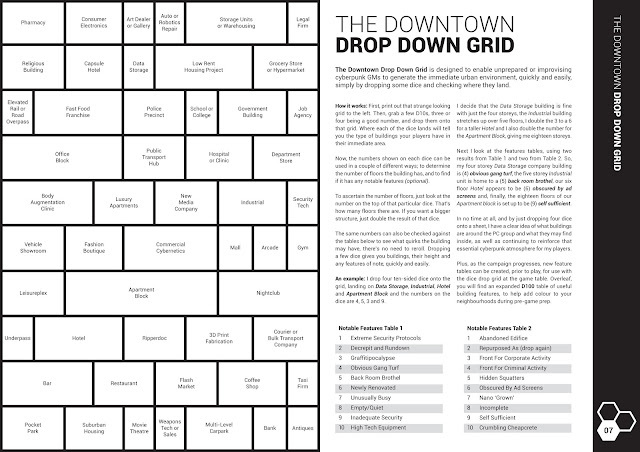 Just finished up a Johnson table, but it focuses on people, so I might see if I can squeeze in another column for macguffins. Quick update on the Johnson table - created a second one that deals with tech items to compliment the first, that deals with target people.